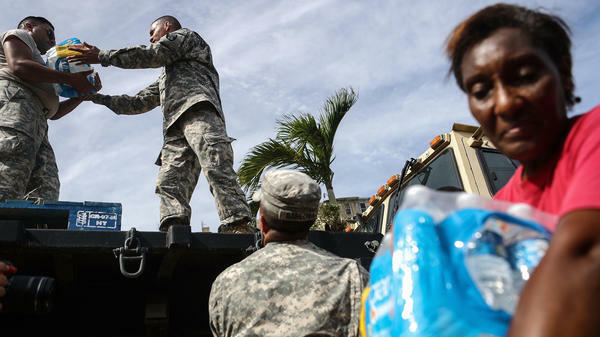 U.S. Army soldiers pass out water, provided by FEMA, to residents in a neighborhood without grid electricity or running water in San Isidro, Puerto Rico, on Oct. 17, 2017. The Federal Emergency Management Agency failed to properly prepare for last year's hurricane season and was unable to provide adequate support to hurricane victims in Puerto Rico and other areas, an internal report released by the agency concluded. The report found Puerto Rico's emergency-supply warehouses were nearly empty when Hurricane Maria hit in October, without things like cots or tarps, because many of the supplies had been rerouted to the U.S. Virgin Islands. The report also found FEMA had been understaffed going into the hurricane season and that most specialized disaster staffers were deployed to the other storms when Maria struck. The initial response was also hampered by huge communication challenges. Almost 95 percent of cell towers were down after the storm. But FEMA did not have enough working satellite phones to adequately spread to the island's leadership, making it difficult to get a handle on the scope of the damage. As emergency supplies arrived, the report found, FEMA faced a major hurdle: it lacked visibility into what was being shipped by other government agencies or private sector partners, further hindering response decisions. "Shipping containers often arrived in Puerto Rico labeled simply as 'disaster supplies,' requiring FEMA staff to unload and open containers to determine their contents," the report stated. Many of the shortcomings outlined in the report — a lack of key supplies on Puerto Rico before the storm, unqualified staff, and challenges with delivering emergency supplies — were detailed in a recent Frontline and NPR documentary, Blackout in Puerto Rico, slated to re-air July 17. The report also found FEMA struggled to track supplies from the mainland to the island and through distribution, saying the agency experienced "business process shortfalls." Frontline and NPR found serious flaws in many of the agency's supply contracts. That lack of planning proved one of the agency's biggest stumbling blocks to the response. The report found the last FEMA disaster planning assessment for Puerto Rico was from 2012 and "underestimated the actual requirements in 2017." In particular, the plans "did not address insufficiently maintained infrastructure (e.g., the electrical grid)" or the "financial liquidity challenges" facing the bankrupt Puerto Rican government. What's more, FEMA's leadership acknowledged it could have better anticipated the need for federal intervention. The report said that in 2011, a report on a FEMA preparedness exercise on the island "anticipated that the territory would require extensive federal support in moving commodities." The most critical of those commodities in the weeks after the storm were generators. But the agency didn't have enough and was unable to quickly acquire more. While the agency ultimately installed more than 2,000 generators on Puerto Rico — a record number — FEMA had only 695 in stock when Maria hit and only 31 on the island three days after the storm. FEMA Administrator Brock Long acknowledged in a foreword to the report that FEMA had work to do to improve its disaster response capability. "With this report, FEMA and the emergency management community have an opportunity to learn from the 2017 Hurricane Season and build a more prepared and resilient Nation," Long wrote. U.S. Rep. Bennie G. Thompson, a Mississippi Democrat who serves on the Committee on Homeland Security, welcomed FEMA's critical assessment but said the agency needs to do more to prepare for this year's hurricane season. "This report still does not explain how or why Puerto Rico was clearly treated differently than the states that faced natural disasters last year," Thompson said. "I sincerely hope that FEMA has learned serious lessons from its inadequate response to Hurricane Maria," he added. "But with this year's hurricane season well underway, FEMA has not shown us that it is ready for anything resembling what we faced last year."